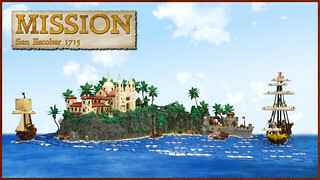 A monastery with a church in the Caribbean. Conquered by the Spaniards in the XVI century, due to its small strategic importance, it did not have much development. 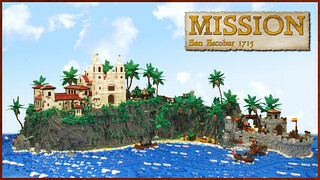 But for that a Jesuit mission was created here to convert the local Caribbean tribe. The monks managed to build a monastery, and later a new sanctuary of Our Lady of San Escobar. The second important building here is the old fort. At the moment we are watching an unusual move in this area. Recently English ship HMS 'Falcon', commanded by Captain Jack O'Brien, came with a special mission. The captain - violin enthusiast - along with his friend - Doctor Mauritius - is just entertaining his (not much busy at the moment) crew with a concert. On the Falcon came Governor Woodes Brickers, who under the Treaty of Utrecht has the mission to take over the island from the Spaniards. At this moment, together with Admiral Nathaniel Elson, they are handing on the relevant documents to a Spanish representative - Coronel Jose Arcadio Demorales. The colonel welcomes the delegation with his maxim - 'Viva la Biba!'. The enthusiasm of their chief is not shared by ordinary Spanish soldiers. On the other side of the island appeared 'Cauldron' - His Piracy's Ship of Captain Rustbeard. His band arrived here with the mission of finding the hidden treasure. They have just succeeded. Thanks to the fact that they previously captured a man named Felipe Bernardo - a man who has a special key - they will soon open the chest found in the cave. Well, they will or they will not make it - the sailor in the bow just discovered the presence of the English ship. 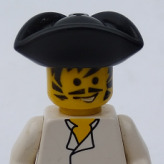 Felipe is a companion of the famous Caribbean hero - Crimson Pirate. They planned to posses the treasure, but their mission was disturbed by the unexpected Crimson love affair with the beautiful Senorita Isaura. At this moment, he is duelling in the courtyard of the monastery with Don Alfonso, an oppressor who imprisoned Isaura on the island with the mission of giving her to a slave trader. Sir Lawrence A. Mistad - that evil one - has just arrived aboard the Falcon and is already looking at the wharf for a new supply of his business. In this critical situation, the fate of the Senorita is fading. Fortunately there is Brother Alforza, who has received from the Prior the mission of helping senorita in escaping from the monastery. In a moment Spanish lieutenant (Teniente), alarmed by the sound of crossed spades, will join the fight in the monastery. He had just visited Prior with the mission of obtaining another batch of liquors for his Comandante in the fort. Meanwhile, outside of great (well, maybe slightly smaller) politics, the ordinary life on the island takes place. There is Bible study at school in the village and in the yard a match of 'green coconut', initiated by the devotee and virtuoso of this game - Brother Lionel. Some natives catch fish by the shore, while others transport their trophies through the rocks to the settlement where the meal is prepared. It is worth paying attention to the small waterfall, above which brother Jeremio Irones devotes himself to the passion of the flutist. You can not miss the small but beautiful beach - La Playa. Robinson Boozoe has been living here for a few years now - he is cheerfully welcoming the colonist family, who (as the only one) has come aboard Falcon with the mission of settling in San Escobar ("A great, wonderful life awaits you", they said ...). You said it took you 2 years to complete and we can see it ! It's huge and full of details ! I particularly like the Natives little settlement scene and the smugglers hide behind the rocks with a great use of the pirate skull brick ! Love the details you put in there, like the skirt of the lady descending the rockface near the pirate ship. I have not been around before to note, but this MOC is one of the greatest, if not the greatest, I have ever seen. 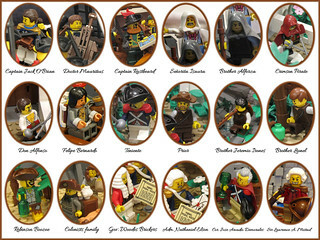 It is the perfect Pirates MOC and I think it deserves much much more credits. 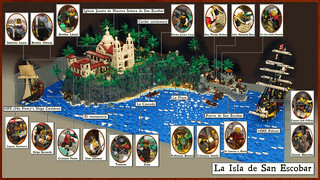 There is not one fault .I see and the Monastery especially looks amazing on the rocky island. All of the small stories taking place makes it such an adventure overall. Really great work.